Hello and welcome to exampundit. 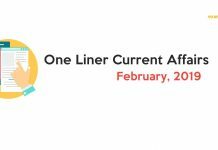 Today we are sharing the One Liner Current Affairs February 2019 PDF of 1st Week. 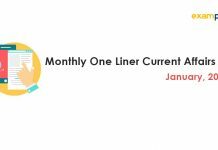 So, this One Liner Current Affairs PDF of February 2019 consists one liner current affairs from February 1 to February 7, 2019. So, this will be beneficial for upcoming Bank and Insurance Exams. 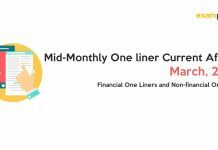 Don’t forget to download the Banking Awareness PDFs. 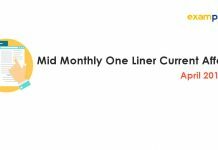 The one liner PDFs are ideal for revision purpose. 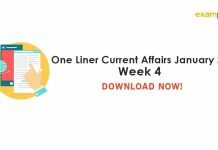 So, if you want to have detailed Current Affairs, you can browse through the Current Affairs section and get all the PDFs for your preparation. Do let us know in the comment what do you want for preparation. 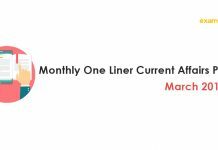 Also, if you ever find any error or any typo in our PDFs, please let us know. All the best for your upcoming exams!